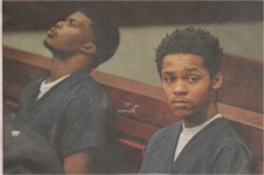 DeAndre Lee Arnold (left) and Jayvon Cates appear for their preliminary examination Monday in 41B District Court in Clinton Township. The defense attorney for one of two young men charged in the stabbing death of a 22-year-old Clinton Township man raised the issue of race while questioning the charges against his client following a court hearing. James Galen said he can't understand why prosecutors charged Jayvon T. Cates, 18, of Mount Clemens, with felony murder in the Feb. 21 stabbing of Alexander Burkart of Clinton Township off Gratiot Avenue in Mount Clemens. Cates and co-defendant DeAndre Lee Arnold, 18, of Mount Clemens, who are both black, appeared in court Monday for a hearing. Burkart was white. Arnold is accused of stabbing Burkart during a street drug deal that turned into a robbery. Arnold told police he acted in self-defense. "Just because we have a young white individual who was killed by a young black male, quite possibly in self-defense, they (prosecutors) have brought in my client and recklessly and totally disregarded all evidence that this was not a robbery or an attempted murder," Galen said. Galen said his client was merely a victim of being in the "wrong place at the wrong time with the wrong person." Galen comments following the first day of an expected two-day preliminary for both defendants in front of Judge Sebastian Lucido in 41B District Court in Clinton Township. Burkart, who delivered food for Happy's Pizza in Mount Clemens, was found stabbed to death in his crashed 2003 Dodge Dakota behind Spears Cleaners, 170 N. Gratiot, north of downtown, minutes after an 8 p.m. altercation with the two defendants in the same parking lot. When sheriff's Deputy Daryn Santini arrived on the scene, the truck door was open, and Burkart's knees were on the ground and his torso was lying across the front seat, Santini testified Monday. Blood was on the ground, in the truck and on Burkart's shirt, Santini said. The deputy said he found large stab wound in the victim's chest. Burkart did not have a pulse, he said. Surveillance video from the Marathon gas station across Park Street that was shown in court Monday indicates Burkart drove his vehicle to meet the two walking defendants in the parking lot. The video, which was shot from a camera dozens of feet away or more, shows one of the defendants falling to the ground as Burkart appears to exit the vehicle. There is some type of altercation, and Burkart re-enters his vehicle while the two defendants are seen fleeing the area, running in opposite directions. Arnold in his written statement says that he fell during the incident and tried to use a knife to scare Burkart but accidentally stabbed him. He said the trio met for a transation involving pills. The preliminary examination, expected to include a handful of witnesses, is scheduled to continue Thursday.